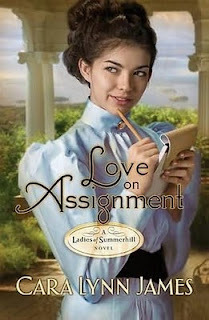 Charlotte is the young newpaper reporter and governess in Love on Assignment by CARA LYNN JAMES. Charlotte's work for the newspaper and for a family takes place in Newport, Rhode Island. Charlotte agrees to spy on Daniel Wilmot, a Christian professor. Mr. Pfifer who owns the Rhode Island newspaper hates Professor Wilmot because he chooses to speak openly and frankly about the way workers are treated as less than citizens in the state. Professor Wilmot believes all men are God's creation. Therefore, workers do not deserve to be treated differently than those in higher positions. Faced with the financial care of her Aunt Amelia and her sister, Becky, Charlotte decides to take the job in the Wilmot's home. At Summerhill, the name of the home, nothing goes as Charlotte expected. This leads to all sorts of troubles for Charlotte Hale. Her only help comes from a growing faith in the help of the LORD.